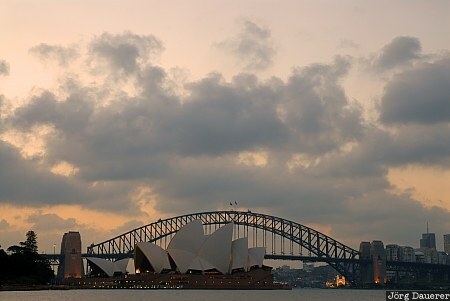 Sydney Opera House with Sydney Harbor Bridge in the background at sunset in front of a colorful sunset sky. Sydney is the capital of New South Wales in the east of Australia. This photo was taken in the evening of a sunny day in April 2007. This photo is part of the exhibition Bridges (February 2019). This photo was taken with a digital camera.